Information describing your 1968, 1969, or 1970 Mustang (no Shelbys, Torinos etc.) can be submitted via email using the form found on this page. Information describing the owner of the vehicle and the warranty plate information is required for submission. Information describing original factory options is optional, but highly desirable. Please contact us directly if you have any questions about the data or the submission process. In 2010 the Registry published our first book containing vehicle statistics including vehicle identification numbers and warranty tag info. We intend to publish additional books in the future. By registering your vehicle you are giving the Mustang 428 Cobra Jet Registry and Muscle Car Research LLC permission in perpetuity to publish the vehicle data you submit to the Registry. 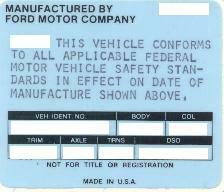 Once a vehicle is registered, it can not be removed from the Registry. Please do not register your vehicle if you do not agree to these terms. Do you have any documentation for your vehicle, such as pictures, an invoice, build sheet, Marti report, or CAC report? This documentation is useful in determining build changes and other production trends. Please consider sharing copies, though note that any information provided becomes the property of the Registry. We'll gladly make copies and return your originals at our expense if requested. Remember that it is your responsibility to let us know if your contact information changes. It would also be nice if you let us know if you sell the vehicle so that we can keep the owner information as up-to-date as possible. If you'd rather not use the following online form, please feel free to download and complete the form provided here. Free Adobe Reader software is required. Registry information sheet in Adobe Acrobat format (564K). PLEASE check your contact information (especially your email address) carefully! If it's valid you'll be sent a copy of the information that's sent to the Registry via email. If your email address is invalid you won't receive a copy, and the Registry administrators might not be able to contact you. Privacy Preference - Select -Yes, you may share my name and email address.No, please ask for permission before sharing any contact information. Your contact information will never, ever be shared with anyone outside the registry project. Participants in the registry project occasionally ask questions about cars and previous owners, or are looking for people who have expertise is particular areas, so it is sometimes helpful for the registry administrators to put project participants in touch with each other. Do we have your permission to share your name and email address with other Registry participants, or should we ask for your permission first? Please include your country code if not in Canada or the United States. Please identify the vehicle's original factory options. This is not a complete list. Please describe options not listed in the "Comments" section. What was the primary source you used to determine the original factory options? Please check here if you have a copy if the build/broadcast sheet for this car. If you do, please consider sharing a copy. Do you have a copy of a Marti report, invoice, or build sheet that you'd like to share? You can submit up to three files to document your car. Pictures are OK, but please be considerate of the file size. Remember that it will take longer to submit large files than it will to submit small files. You may submit up to three files. Please feel free to share any other information about your car. This form is for providing information describing 428 CJ and SCJ Mustangs ONLY. No Shelbys, Torinos, or anything other than 1968-1970 Mustangs originally equipped with a 428 Cobra Jet or Super Cobra Jet engine, please. If you include questions in your comments we will try to respond as quickly as possible, so please double check your email address to make sure it's valid. When you hit "Submit" you'll create an email message that gets sent both to you and to the Registry administrators.